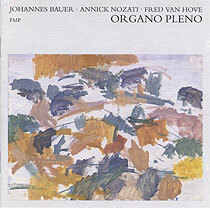 Fred Van Hove, piano, accordion; Annick Nozati, voice; Johannes Bauer, trombone. Recorded live during the Workshop Freie Musik, on 10-12 July 1992, at the Akademie der Künste, Berlin. Front cover artwork (reproduced above) by Marion Stille; layout by Jost Gebers.